Wow if you are looking for a Lhasa, you need to meet this boy, he is incredibly awesome. Normally you can see him finding all the toys in the house, and running around with a smile on his face. He is great with all other dogs, probably would love to have a friend to play with. 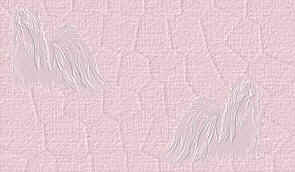 He has all the gaiety and joy of a Lhasa, he is extremely special. He has lots of energy and wants to play, walk and be with people who will give him lots of attention. He is good for baths and grooming. He meets and greets people without a bark, only a wagging tail and sparkling eyes hoping someone will pet him and pick him up. Sweet and mellow are good words to describe Tino. 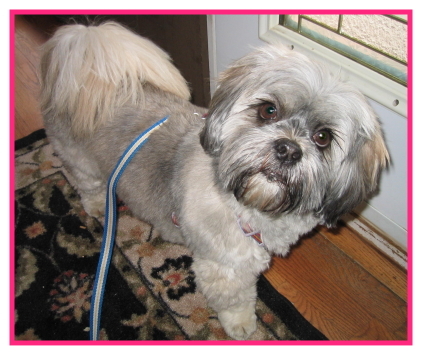 On the small side for a Lhasa, Tino is a patient boy who gets along well with the other dogs in his foster home. He is very food motivated, and likes taking leisurely strolls that are marked by frequent stops to sniff, gaze about and check out what’s going on around him. Until his fur grows out a bit (he came to us very matted and his coat was consequently clipped very short), Tino is most comfortable in a sweater when he is outside. He prefers to be on the bed and under the covers at night. He enjoys toys or a tasty rawhide chew or hoof. Tino has an odd bark (he may have been de-barked), and occasionally exhibits the infamous Lhasa attitude. Quiet and undemanding, Tino wants to be close to his person: on the floor at foster mom’s feet or on the couch beside her. He was very neglected prior to coming to us, and will need time in his new forever home to develop trust. Does your heart cry out for a laid-back, peaceful little pooch who will provide warmth and companionship? Tino may be your guy. 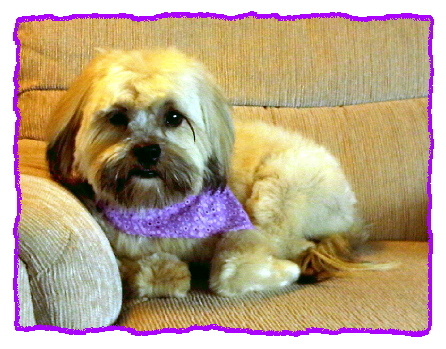 Beau is a wonderful Lhasa. He would be happy to just lay down on your lap all day if he could. He loves car rides, and is so well behaved, except if in a parked car and someone walks by, then his "I am protecting mode kicks in"
He is such a lover and very social in his foster home, allowing strangers to hold him. He does very well with other dogs his own size. He is doing well with going potty outside. He comes when called...he is a very motivated lil fellow. 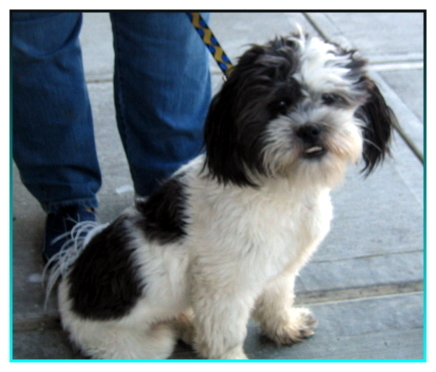 Whoever adopts this boy, will have one the nicest Lhasa boys ever. Ps...I was a very loved lil boy, my ex owners adored me, and I adored them..I do miss them so much, so hope I can find someone to love again. "Be devoted to me and I'll be your best friend forever"
Tia is such a gorgeous girl. She LOVES walks, playing with her stuffy toys, hanging by you when she can. She takes a couple of days to warm up, but will warm up quickly to a woman, another day for a man. She had not been socialized as well as she should have been. Once arriving here she was overwhelmed with the other dogs, all similar breeds, but in a couple of days she learned to adjust. She would prefer to be an only dog, or if someone gives her time to adjust to a resident dog of similar breed. 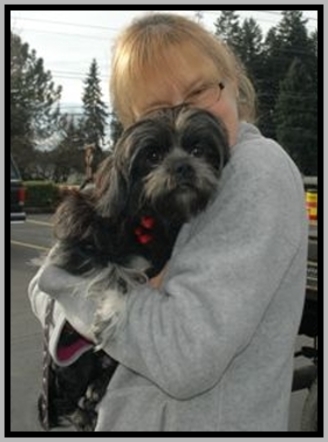 She does not do well with children, as so many of these Lhasa..but she would adore to have a Mommy or Daddy , to take her for long walks, play fetch with her toys, and be the center of someone's world. 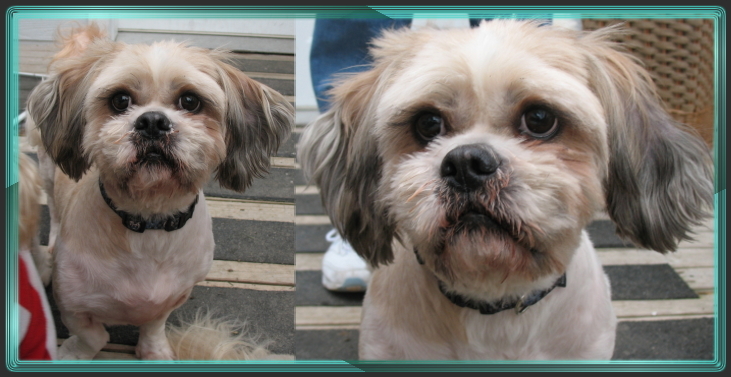 Baron is a very loving loyal lhasa boy. He is slow to trust new people but once he trusts you he is your friend for life. Bear LOVES going places: walks, car rides, shopping...he loves it all. Some days it is hard to get out of the door without him (smile). Baron has food allergies that seem to be well controlled with good food and careful treats. He gets very upset when he thinks he has done something wrong and seems to think he is going to be hit. He can get snappy if he is confronted but responds well to firm commands and verbal direction. 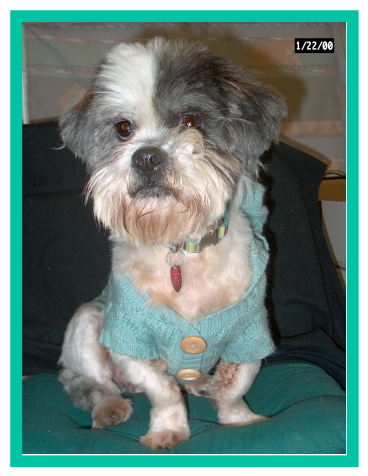 Baron needs a lhasa experienced home where he will become your loyal loving best friend. Max is an awesome dog . He loves everyone, is easy going and calm around the house. He loves to go for walks and to play with toys. Is a great cuddlier and wonderful companion. He has not heard about the "lhasa-tude" that most Lhasas have. He would be an absolutely wonderful store dog. Max has only 2 requests in his search for a forever home. No cats-he chases them relentlessly; and minimum of travel-Max gets very car sick. These 2 issues have caused him to be passed around quite a bit in the last few years. Max is also on a special diet due to his allergies; as long as he stays on this diet he has no problems. He is extremely healthy and has received excellent medical care. He comes with all of his medical records including allergy testing. If you are a homebody looking for a companion for walks, gardening, TV watching and general lounging around this wonderful boy is waiting to join you. Tanner has never met anyone he doesn't like. 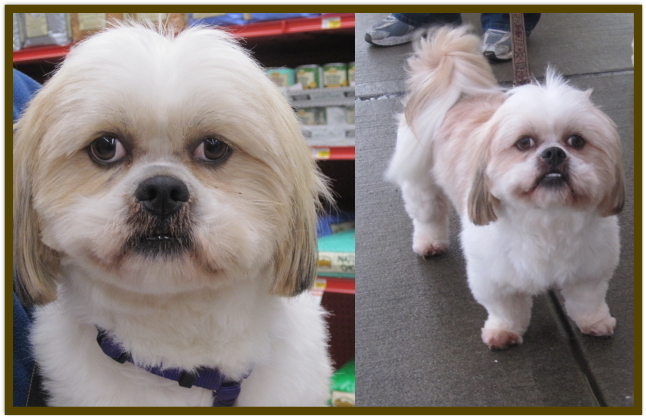 He is very unusual for a Lhasa in that he goes up to everyone he meets for pets. He sits or stands and waves his paws for treats. He loves other similar size dogs and loves to play with other dogs or with his people. Tanner loves to ride in the car and likes walks though he is still learning not to pull on the lead. Tanner was turned into the shelter, so badly matted, he was unable to walk, and had obviously been on his own for a while. He was a bit feisty until the was shaved down and got comfortable he then proceeded to become a staff favorite. 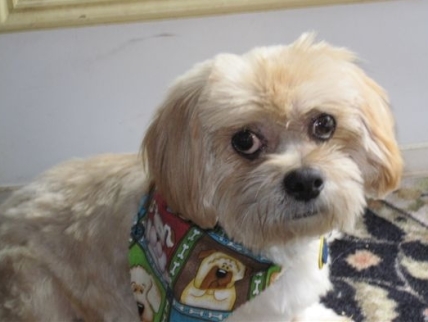 Because Lhasa's are not usually good with children, we are looking for an adult home (teens over 16 OK) for Tanner but visiting grandchildren would be OK. Tanner loves to run in the yard and to explore. He would be a great gardening partner and a wonderful companion. Grady (the Dude) is a wonderful puppy. Grady loves car rides, playing with toys and with doggie friends, running in the yard and cuddling on your lap. Grady has been in 5 homes in his young life, as he was sold from home to home on Craig's list. This is why this young boy, answers to both Grady and Dude. In his last home, the dog of the house did not like Grady, before that people were moving, and he was too active for an apartment. Grady is a very smart boy who really wants to please. (An obedience training class is an adoption requirement with this boy). He learns quickly and just wants for his next home to be "forever." Are you the family to fulfill that dream for this little Dude? Honey is really well-behaved: she's very quiet and seldom barks, but she does break out with her joyful doggy dancing bark-songs when she welcomes home her foster family. She waits for permission to come up on the furniture or hop on the bed for a little bedtime book-read and cuddle, which she loves. She's house-trained and is doing well being left at home with a buddy during the day; unknown so far about being alone. She does stay close with her foster family, although she's gaining a little more confidence every day in her new situation. Also unknown about cats and small children, although bigger kids are fine. She doesn't have any food aggression issues and leaves her bowl when she's full. She loves to go for walks on her leash and rambles around the yard with her new doggy friends: she loves to meet and greet all who cross her path. She's quiet and well-behaved in the car but a little scared, maybe because all of her recent car trips have been ending up in one strange place after another! She may just need a spot of patience and some great car ride memories with her new family to make that all go away. Honey hasn't broken loose and played games with her buddies or the toys so far, although she clearly has a spirit of fun. Too early to know if she simply isn't inclined or she needs to feel more comfortable before she let's herself get crazy. It may be that Honey should have a little celebration with her new family on the first day that she MISbehaves. What is certain is that Honey truly deserves to spend the rest of her life with a forever family who cherishes her; She's just the loveliest little girl you'll ever find. OK - everyone, here's the treasure of the season - Molson! He's a lap sitter and could be called Shadow because he quietly follows you around the house. If you need some "private time" in a room, he'll wait outside the door guarding the entry, doing his job to keep his "forever human" safe. This boy will no doubt be a loving and constant companion to his forever person. He takes correction well and his house manners are better than a lot of humans. He loves to walk and we have found him to be playful with other doggies. If you are entertaining friends, you could make some side bets by betting that your dog (Molson) is so smart that you can just point your finger at Molson and say "Bang" and he'll fall over as if he just died. All you have to do before you collect the money from winning the bets is give Molson a nice tummy rub as a reward. He loves those tummy rubs! One thing about Molson that is especially nice is he could be adopted into a home with no dogs or with other dogs. He is able to fall into the pack just about anywhere without any fuss. That's a great trait in a dog .He could be equally happy as an only dog and have your undivided attention. Just about every dog will develop some health issues in their lifetime if an owner is really aware of their dog's physical condition. Molson has two easy to care for health issues. One is the thyroid. The meds are very inexpensive and easy to administer. The second is dry eye. Just as humans age and get dry eye, dogs can develop dry eye for various reasons. Again, this is an easy condition to deal with. Oh, one last thing - If you're concerned about Molson's age of 6-7 years being too old, please consider this. He's past the puppy stage of chewing up socks, needing to be housebroken, and some of the puppy activities that make us humans realize how old we're getting after dealing with a puppy. But Molson still has that calmer adult dog energy to keep up with just about anyone for many years to come. Molson is the kind of dog that once he's yours, you'll be so grateful that you didn't pass over him because he was just a little bit older. This little guy is a year and a half old and the perfect example of a goofy teenage Lhasa-boy! Robin is a personable, stocky little klutz who invariably trips on the stairs, falls off the couch, thinks that "Dog Whisperer" Dvd's mean that there are invisible dogs hiding from him in the closet, and waits patiently to go in and out on the hinge side of the door. Just when you might start to be worried that this poor little boy suffered an unfortunate birth-event, he's begun to out-play the reigning canine queen of the psychological thriller "Stalk & Steal all your Toys" game. (This game can last as long as Monopoly and requires both strategy and cunning). When Robin gets all grown up, he just might be downright smart! Meanwhile, his forever family is missing a truly funny and memorable time of his life. Robin was abandoned at the Humane Society by his previous owners with no training or social skills, but this little boy has come a long way in rescue and is now in good shape to complete doggy "finishing school" with his new family. They should all attend a dog training class and get lots of practice with a firm manner, but that's a great way to spend bonding time together. Robby adores trucking along on a good walk, heels (... after a bit of exuberant puppy-joy), loves car rides and crates well. He's pee-pad trained and still gets regular trips outside to finish off his house-training. He loves to play and cuddle, but settles down well when left. What little Robby really longs for is somebody to be his very own person to love! No small children, needs a fence or leash, and although he gets along with his foster brother and sister, would probably be happiest as an only dog. If you don't mind helping this little guy complete his training regime, you will be rewarded by years and years of Lhasa-love, laughter and interesting company! I am Teddy, the psychic dog and right now I am reading your mind. You want a dog that isn't clinging, and doesn't require constant petting or holding. THAT'S ME! You want a dog that will follow you around and enjoy just being in the same room with you, quietly watching or sleeping nearby you as go about what you're doing. THAT'S ME AGAIN! I can also read in your mind that you want a dog that is excited about going for walks and THAT'S ME AGAIN and boy, oh boy, do I need to go for walks and trim down a pound or two or three. Wow, you just thought about how great it would be if I loved going for rides and really behaved well in the car. GOLLY, can you believe it? THAT'S ME AGAIN! Now if you want to try reading MY mind you'll be correct if you get the message that I am a gem of a dog and very easy going. You should also get the message that I can be shy around men because of some probable abuse in my past but I am capable of conquering that as long as you understand it and help me. You should also learn that I like people (even with the man shyness issue) and I like other dogs. You won't find anything in my mind about cats though because I've never dealt with them so I don't have any thoughts to read on that subject. I see in my future a REAL FOREVER HOME with a person who truly understands the word FOREVER. I see in my future.......YOU!!!! By the way, Furbaby Rescue can't read minds too well, so you'll need to e-mail them for an application to adopt Teddy, the psychic dog. Clayton is a beautiful boy who loves going for walks, meeting new people, and car rides. He runs through the yard with the biggest grin you have ever seen on his face. He loves to play with other dogs and runs up begging for pets not only from people he knows but from those he has just met. He loves curling up in a soft bed near his person and sleeps in that bed peacefully all night. He is good for grooming and loves his bathes. This beautiful young dog came to us from a shelter in Oregon where he was found wandering with no tags. He was very grumpy and snappy but seemed like a very young dog so Furbaby Rescue was asked to take him in. Soon after coming into rescue, Clayton's grumpiness was explained when he was found to have multiple bladder stones. After recovering from this surgery (and his neuter and hernia repair) we finally began to see the Lhasa boy himself. 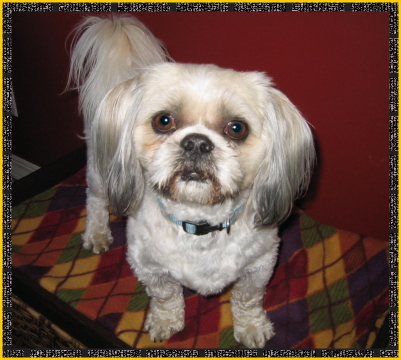 Clayton has all of the intelligence, joy, loyalty and determination that makes us love Lhasa's. He also has some Lhasa-tude". We're looking for a home that hopefully has some Lhasa experience and a person who can help Clayton continue to improve on some bad habits he acquired through no fault of his own. He's already graduated to an all new level of doggie manners from what he was but he still needs a persistent, understanding human to refine his skills into being a gentleman with his chews, bones, and food bowl. Once Clayton has the patient, loving, knowledgeable owner he deserves, he should progress nicely to his next level of very good behavior and earn his "Gentleman Clayton" title. Clayton is very active and to have another dog of a similar breed could help refine Clayton into the best he can be. Clayton will need an adult only home in order to keep progressing. Clayton badly wants to belong and is so smart, training is a joy. If you have the experience, patience and love to work with him you with will find yourself with a true heart dog.